The surge of attention given to adat (custom) is a distinctive feature in present-day Indonesian local society. The decentralization regulation (Law No. 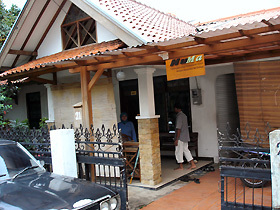 22/1999 on Regional Administration), which was legislated one year after the collapse of the Suharto regime, defined adat as the basis of village administration. Given that Indonesia is predominantly rural, it is hardly surprising that there has been a rapidly growing interest in adat among local people, especially local politicians and intellectuals. In response to this situation, a number of NGOs have been established to give active support to the revitalization of adat in local society. During this trip, I visited two such NGOs' head offices in Jakarta and collected some information on their activities and publications. In addition, I gathered materials on an amendment to Law No. 22/1999 and the spreading effects of a newly revised regulation (Law No. 32/2004 on Regional Administration) at the Center for Scientific Documentation and Information (PDII-LIPI), the National Library of Indonesia, and at bookstores and publishing companies. Due to limited time, I could visit only two NGO offices in Jakarta during this trip. On my next trip to Indonesia, I hope to make contact with a few more of the NGOs that are generating discussion about adat and have headquarters outside Jakarta, such as Forum for Community Participation Development (FPPM: Forum Pengembangan Partisipasi Masyarakat). The head office of HuMa. I remember the kind welcome the staff extended on my visit to the office. 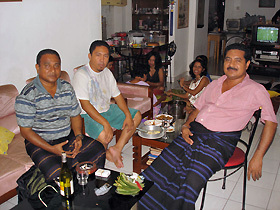 My dear old friends in Jakarta gathered to hold a welcome and farewell party for me on Saturday night, March 27, 2005. Thank you very much for a wonderful evening.